Does this happen to you? You’re reading a book, or watching a documentary, and something is mentioned in passing, something not really related to the topic at hand, and now you can’t get that “something” out of your mind? For me, it’s a common occurrence. I was reading The Wild Wisdom of Weeds. 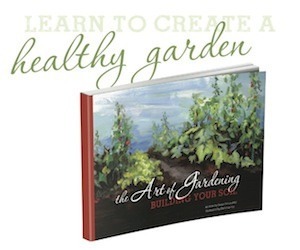 A book about weeds, ya know? 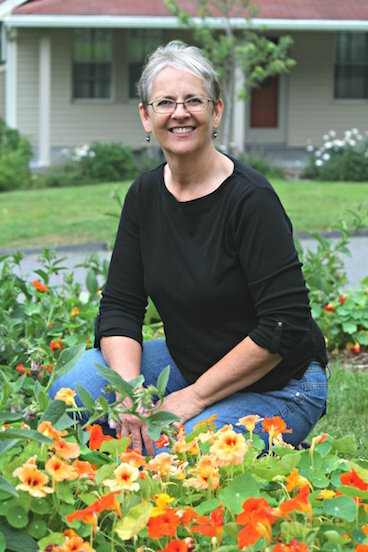 And author Katrina Blair mentions an event in her town where the community collects apples, makes cider, and uses the pulp in various ways. And one of those ways is to make apple sugar. Wait. What? Apple sugar? The pulp is dehydrated and then ground to a powder that is used for sweetening. But what about the seeds? So I did what everyone does when they want some information. I asked google. It was just after apple season last year when I read this, and I’ve been mulling it over waiting for apples again to experiment. I still don’t know how they do it, but I’ve come up with my own way. And it’s sweet and powdery, and oh so yummy. And a really nice way to use apples when there’s lots around. Like this year. The foraging is fantastic, and the cultivated trees are doing great, as well. I’m still experimenting with using my apple sugar. It’s really tasty on oatmeal. And I made an apple crisp using just apple sugar as the sweetener. 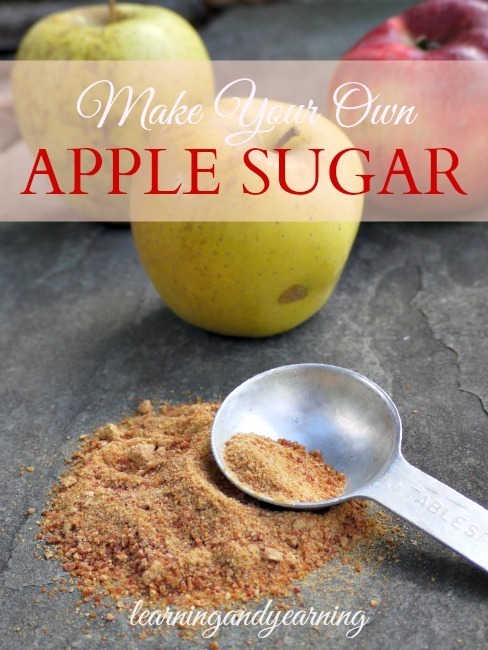 I found that I needed twice as much apple sugar as the regular sugar called for in the recipe; we really enjoyed it. Apple sugar doesn’t quite dissolve in tea, but I was still surprised by the delicate sweetness it added. The following recipe creates a raw sugar. I have yet to try to make the apple sugar with apple sauce. I feel pretty certain that it would work just as well, but of course would no longer be a raw sugar, and also would not take advantage of using the skins if the apple sauce is put through a food mill or Squeezo. I’ll let you know how it turns out when I have a chance to try it. Edited 10-19-15: I made apple sauce this past weekend and used some to make apple sugar. I had a little trouble getting the sauce to spread as thin as I would have liked, so it took longer to dry than my raw apple version. The sugar was also a much lighter color because the skins were not used. Tasted just as lovely. 8 cups of pureed apples yields approximately 2 cups of apple sugar. 2. Quarter and core the apples, but do not peel them. 3. Slice the apples into smaller pieces, unless you have a super powerful blender. 4. Add your apples to a blender or food processor in small batches. I use a Magic Bullet. Add just enough water to puree the raw apples. I have found that more water is needed with a food processor than with the Magic Bullet. 5. Spread the pureed apples very thinly on your dehydrator's fruit leather sheets. Dehydrate at 140°F. You want the puree to dry well beyond the fruit leather stage, until it is crispy. This may take up to 24 hours depending on how much water you had to use as you pureed the apples. 6. When the puree is crisp, remove it from the dehydrator and allow to cool. 7. Grind the dehydrated puree in a blender until it is powdered. Store in an airtight container. Ha! Who knew! I’ll definitely be giving this one a try! I think you’ll love it, Melissa! Rely Wow! Will definitely be trying this! Thank you! I made apple syrup last year by cooking down apple cider in my slow cooker until it thickened. It took a couple of days and turned very dark. I wonder if you could make apple sugar if you boiled it down further — like maple syrup. Your way is much easier than my apple syrup. Oh, but that apple syrup sounds devine! I love making apple syrup, too, but I know that as it gets thicker, the solids in the cider can burn. If there’s a way to use a dehydrator to dry out the apple syrup, though, perhaps the resulting product could be processed just like the dried apples in the recipe above. Only one way to find out! Let us know how that turns out, Mark! I love this! I want to try making it and using it for apple pie. I’d love to hear how that turns out, Rachel. I haven’t tried sweetening pie with it yet. What a cool idea! I’m thinking now about the pulp leftover after apples have gone through the juicer. I don’t have seeds in that and am going to have to give that a try next season. Thanks so much for this. Yes, Kathie, that should work just fine! This is probably what they were making. Your fruit powder is cool. Use it in straws to make pixie sticks for kids. Dont tell them they are eating fruit. How did I miss that mention when I read that book? I guess I was focused on the weeds. This is a neat idea. We have a bunch of crabapples left to harvest, so I know where some of them are going. Let me know how this works with crabapples, Laurie! I had some apples and I have done about everything that I know to do with apples already so this is a great idea. I have some in the dehydrator right now. Thanks for the recipe. You’re welcome, Krista. Thanks for stopping by. I’m going to try this, but will dehydrate at less than 118° so the product remains a living food. I think it will be interesting to sprinkle on raw cookies. My mom used to make apple sugar and used it exclusively for making jams and jellies. Apparently pectin levels are high in apple sugar. I’m gonna hafta try making the sugar and see if I can duplicate my mother’s jam and jelly success with it. Thanks so much for the recipe and for rekindling a forgotten memory! I’d love to hear more, Louise! Oh, that makes perfect sense. 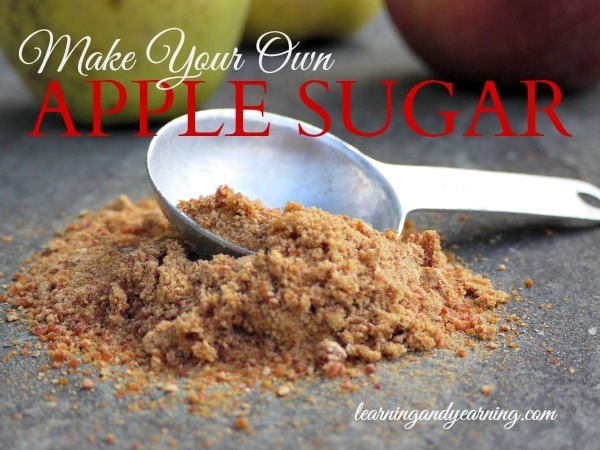 What a great use for the apple sugar. I don’t have the fruit leather sheets, can the apples be dried on a cookie sheet in the oven? That should work just fine, Helena, but be sure to keep the temperature as low as possible, and spread the puree very thin. With higher temps, the outside may dry out while the inside remains wet. This is what I love about your blog! Always something new and creative. Such a sweet thing to say; thank you, Kristel!!! Wow, this sounds SO delicious! And looks super easy to make. Who knew? I’m definitely going to have to give it a try!!! Thanks so much!! Thanks, Karen. Glad you stopped by! It’s a great way to use those apples, Adriana! I make sugar just from the skins of organic pears, apples etc. I just dry them and then grind them into a powder. The result seems to be very much like yours and it is so easy. That’s a great idea, Hilda! Next time I bake a pie and peel apples, I’ll do the same. 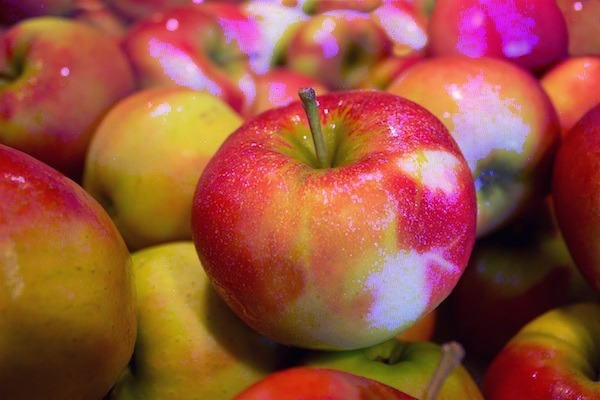 What is the difference between your apple sugar and powdered dehydrated apples? I haven’t heard of powdered dehydrated apples, but it sounds like the same thing to me. I’m so excited about this idea! I’m hoping I can still get apples from the nearby orchard. Mine have all been turned into applesauce! Bet it would be delicious on oatmeal. 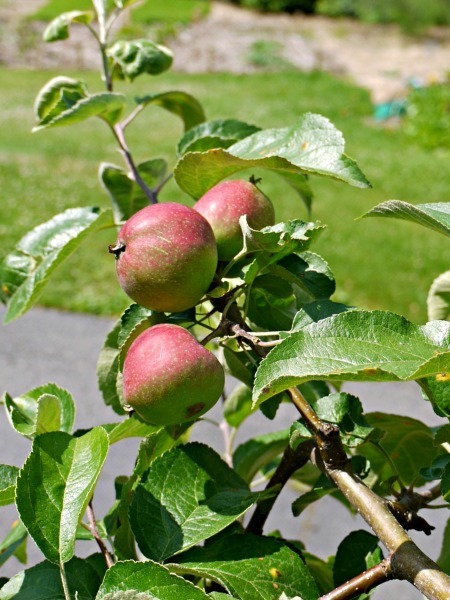 Great idea for a sugar that has all the nutrients of the apple. Another idea that would probably allow it to fully dissolve is to juice the apple. Then evaporate it as as they do cane juice (ie Sucanat or evaporated cane juice). There was a sugar cane field where we lived in South Africa as a kid. Concentrate Juice of Apple is used in the industry to sweeten other juices and was wondering in my mind if it is possible to produce the powder for that… And I found you. Thanks. Love this post! I feel the same way about a jar of cider jelly I received from a friend… there’s no recipe anywhere to make it! I figure you just boil the cider down for basically forever 😉 but still, I’d love to find a recipe… especially one from the pioneer days, which would be fun! I found a really great recipe for cider jelly it’s at http://www.goodfoodstories.com/apple-cider-jelly/ and yes it’s traditionally made by boiling cider for forever this one (and many others I found) uses low/no sugar pectin and a small amount (if any) of sugar compared to the tons that are in other recipes. I have used Parchment Paper instead of Fruit Leather Sheets it works very well. Thanks for this tip Kelly! 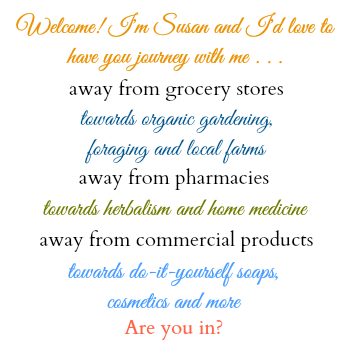 Susan – I love your site and I think I was meant to find you here! I was rereading the “Creating Abundance” section of “The Wild Wisdom of Weeds” and wanted to learn different ways to prepare apple sugar… and here I am. I have only been to this page so far and already found a useful tip on an alternative to fruit leather drying sheets (from co-commentor, Kelly.) I too am on a journey to reconnect to my humanity, to discover my indigenous self by embracing “Mitakuye Oyasin” as a guiding principle for my life. Thank you Susan, y mucho gusto! Thanks for stopping by, Tammy, and for the kind words! We have a freeze dryer and I think it would work perfectly for this. Oh, yes. I’d love to hear how it turns out! Who has a freeze dryer? Lol. AWESOME! I am curious about the sugar content concerning diabetics…I am considered pre-diabetic so have given up sugar… this would taste great on oatmeal or dry cereal…not sure what amount would equal an apple. Great question; I think you’d have to keep track of how many apples you dehydrate and then divide the final amount of sugar by number of apples. I have a lot of food intolerances/allergies and health problems that don’t allow any traditional cane sugar (and the like) in my diet. This recipe is just genius and I wanted to thank you for sharing your recipe with us, it’s truly a gift! P.S. do you think that a pure mango “sugar” could be made with this recipe? You’re very welcome! All I can say is, give it a try and let me know how it goes! If you can do this with apples, I’m thinking it might be possible to do this with sweet strawberries or even peaches. Have you tried it with any other fruits? I’ve only used apples, Debby, but I don’t see why other fruits wouldn’t work! I like this idea but I think I’d rather try it with pears since they seem to be sweeter than apples? bigger yield? Sounds like an amazing idea! !